Objective: To evaluate the usefulness of individualised homoeopathic medicines in treatment of Attention Deficit Hyperactivity Disorder (ADHD). Design: Randomised placebo-controlled single-blind pilot trial. Setting: Central Research Institute (Homoeopathy), Kottayam, Kerala, India from June 2009 to November 2011. Participants: Children aged 6-15 years meeting the Diagnostic Statistical Manual of mental disorders (DSM-IV) criteria for ADHD. Interventions: A total of 61 patients (Homoeopathy = 30, placebo = 31) were randomised to receive either individualised homoeopathic medicine in fifty millesimal (LM) potency or placebo for a period of one year. Outcome measures: Conner's Parent Rating Scale-Revised: Short (CPRS-R (S)), Clinical Global Impression-Severity Scale (CGI-SS), Clinical Global Impression- Improvement Scale (CGI-IS) and Academic performance. Results: A total of 54 patients (homoeopathy = 27, placebo = 27) were analysed under modified intention to treat (ITT). All patients in homoeopathy group showed better outcome in baseline adjusted General Linear Model (GLM) repeated measures ANCOVA for oppositional, cognition problems, hyperactivity and ADHD Index (domains of CPRS-R (S)) and CGI-IS at T3, T6, T9 and T12 (P = 0.0001). The mean baseline-adjusted treatment difference between groups at month 12 from baseline for all individual outcome measures favoured homoeopathy group; Oppositional (−16.4, 95% CI - 20.5 to − 12.2, P = 0.0001), Cognition problems (−15.5, 95% CI − 19.2 to − 11.8, P = 0.0001), Hyperactivity (−20.6, 95% CI − 25.6 to − 15.4, P = 0.0001), ADHD I (−15.6, 95% CI − 19.5 to − 11.6, P = 0.0001), Academic performance 14.4%, 95% CI 8.3 to 20.5, P = 0.0001), CGISS (−1.6, 95% CI − 1.9 to − 1.2, P = 0.0001), CGIIS (−1.6, 95% CI − 2.3 to -0.9, P = 0.0001). Conclusion: This pilot study provides evidence to support the therapeutic effects of individualised homoeopathic medicines in ADHD children. However, the results need to be validated in multi-center randomised double-blind placebo-controlled clinical trial. Lamont  conducted a double-blind placebo-controlled partial cross-over trial in which homoeopathic medicines in centesimal potency were superior to placebo and acted well in 200C potency. Frei and colleagues ,,, used individualised homoeopathic medicines in LM (50 millesimal) potencies and the results appear to be similar to the effects of methylphenidate particularly in pre-school children. In these studies, amelioration of symptoms by 50% as shown on the Conner's Parent Rating Scale (CPRS) was achieved after average treatment duration of 5.1 months. However, they are of the view that randomisation at the start of treatment in a randomised clinical trial (RCT) of homoeopathy has a high risk of failure in demonstrating a specific treatment effect, if the observation time is shorter than 12 months. Further, the use of polarity analysis  in one of the studies, lead to an increase in the success rate of the first prescription from 21% to 54% and 68% to 84% of the fifth prescription. But a randomised double-blind placebo-controlled pilot study on ADHD children, conducted by Jacobs et al.,  had shown negative results. On critical analysis, four pitfalls were presumed by Frei and colleagues  for negative results in the Jacobs study. They are: (a) restriction to three prescriptions caused pressure to physicians in prescription, (b) short period of observation (18 weeks), (c) effects of single doses repeated at long intervals are often subject to interference of external factor (such as family conflicts, school-related stress, exciting events leading to unstable amelioration) and (d) inclusion of children having stimulant medication which in turn reacted slowly to homoeopathy. Systematic review  of homoeopathic therapy on ADHD in children, however, concluded that there is little evidence to prove the efficacy of homoeopathy for the treatment of ADHD. Furthermore, development of optimal treatment protocol before undertaking further RCTs was recommended. Keeping in view the above pitfalls, the present study was designed to evaluate the effectiveness of individualised homoeopathic medicines in LM potencies in the treatment of ADHD children, to gather data from Indian subcontinent for definitive study and to derive optimal homoeopathic treatment protocol for ADHD by considering all points for individualisation. Homoeopathic individualisation means that every aspect of patient's individuality was considered. To evaluate the usefulness of individualised homoeopathic medicines in treatment of ADHD. To deduce feasibility of study design and to gather data for sample size calculation of definitive study. A randomised controlled single-blind (parallel arm) study was conducted on ADHD children at Central Research Institute (Homoeopathy), Kottayam, to evaluate the efficacy of individualised homoeopathic medicines in LM potencies. The Council's Ethical Committee approved the study protocol. Investigator experienced in dealing with this disorder was trained in the protocol. Written informed consent was received from the guardians of all the children enrolled. The study had also been registered retrospectively in Clinical Trial Registry India, CTRI/2011/12/002305. Consultant psychiatrist was also engaged for the study. The total study period was for a period 2 years and 6 months (June 2009-November 2011) including one year of interventional treatment, which was conducted at Central Research Institute, Kottayam, Kerala, a premiere institute under Central Council for Research in Homoeopathy for psychiatric disorders. Children in the age group of 6-15 years and meeting the Diagnostic and Statistical Manual of Mental Disorders 4th edition (DSM-IV) criteria for ADHD  were included. Children with any chronic physical or neurological disorder, history of drug abuse, seizure, Tic disorder, Tourette syndrome, severely ill patient requiring hospitalisation and patients who were on anti-ADHD or psychoactive medications in the previous two weeks were excluded. Investigators were instructed to make an in-depth interview with the patient, as per the guidelines laid down by Dr. Samuel Hahnemann in 6 th edition of Organon of Medicine. The children enrolled in the study were not on any other non-pharmacological intervention like operational therapy, play therapy and behavioural modification. Kentian method  of evaluation and repertorisation using Hompath software  was used to reach the similimum. However, final decision was made after consultation with materia medica.The homoeopathic medicines in LM potencies were procured from a company certified for Good Manufacturing Practices (GMP). The parents/guardians of the the children enrolled in the study were advised to give ten uniformly forceful downward strokes to the bottle with the hand on a hard surface and to take three tea-spoonfuls (15 ml) of this solution and mix it in eight tea-spoonfuls (40 ml) of water in a clean glass after stirring the solution before each dose of medicine taken. One tea spoonful (5 ml) of this solution constituted one dose. Patients randomised to the placebo group received placebo, which was similar in all the manners to that of homoeopathic group including the process of administration. However, it constituted un-medicated poppy size sugar globule impregnated with dispensing alcohol. Any change triggered after administration (improvement/deterioration) was followed by placebo only. Due to ethical reasons, patients with acute complaints were given individualised homoeopathic medicines. The primary outcome measures were changes in Conner's Parents Rating Scale-revised: Short (CPRS-R (s)),  Clinical Global impression severity scale (CGI-SS),  Clinical Global Impression-improvement scale (CGI-IS);  CGI-SS is based on a seven point scale ranging from 1 to 7 where 1 indicates normal, not at all ill, and 7 indicates most extremely ill. Similarly in CGI-IS, 1 indicates patient very much improved and 7 indicates very much worse. CPRS-R was completed by parents/guardians. The investigator and consultant psychiatrist guided in translating into local language for better understanding if required. CGI-SS, CGI-IS were assessed by the investigator and consultant psychiatrist. Data related to these questionnaires were collected at baseline and at monthly intervals for 12 months. In addition, the record of academic performance in school was also collected before and after the treatment. However, the parents were advised to consult the investigator prior to scheduled visit, if they found it required for any other complaint apart the prime disease, i.e., ADHD. Being a pilot study, 30 patients in each group are sufficient to gather data for sample size calculation, for larger definitive study. Keeping in view 20% dropouts, 72 patients were to be initially enrolled (36 in each group) but only 61 patients were enrolled. Statistical analysis was done using SPSS version 20. Comparisons between homoeopathy and placebo groups were performed at baseline (T0) to assess randomisation effect using independent t-test for continuous variable and Chi-square test for categorical variables. Seven patients who were observed to be wrongly randomised at baseline, during site visit, were not considered for analysis. Missing data were replaced by last assessed value as per the last observation carry forward method (LOCF) under modified Intention to treat (mITT) analysis. An analysis of covariance with follow up at different times as the dependent variable; baseline and treatment group as covariate and independent variable was undertaken to account for potential baseline differences. The questionnaires: Four domains of CPRS-R, CGI-SS and CGI-IS was obtained at time periods T3, T6, T9 and T12 were compared using a General Linear Model Analysis of covariance (GLM-ANCOVA) for repeated measures with time period T0 as covariate in respect to time and time vs group. Further comparison of all outcome measures at T0, T12 was tested simultaneously using multivariate repeated measures analysis of variance (ANOVA). Another multivariate repeated measure ANOVA was carried out to examine whether change was the same between the two interventions. In the former repeated measures ANOVA, time (2 levels: Pre and post) was treated as a within subject factor, but there was no between subject factor, that is between two groups. In the latter repeated measures ANOVA, groups (2 levels: Homoeopathy vs. Placebo) was fitted into the model as a between subject factor. Paired t-test was also carried out for assessing the difference (T12-T0) in individual variable in each group. The treatment differences were compared between groups using univariate GLM with baseline as covariate. Resulting baseline adjusted treatment effects are given together with 95% Confidence Interval (CI) and corresponding P values. In all the analyses, P < 0.05 was considered significant. A total of 61 children diagnosed with ADHD were enrolled. Seven children were excluded from analysis after enrolment for not following randomisation. Out of 54 patients (homoeopathy = 27, placebo = 27) analysed under mITT [Figure 1], 43 (79.6%) were male and 11 (20.4%) were female. The mean (SD) age was 9.3 years (2.8 years), CGI-SS was 3.8 (0.5). 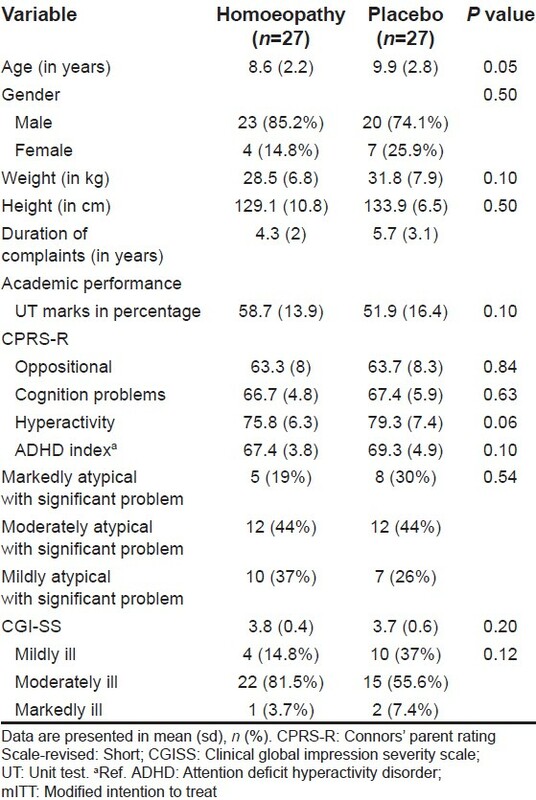 As per ADHD Index, , 13 children were markedly atypical with significant problem H:5; P:8; 24 were moderately atypical with significant problem H:12; P:12 and 17 were mildly atypical with possible significant problem (H: 10; P: 07). The baseline characteristics of the patients are given in [Table 1]. Both the groups were comparable at baseline (p ≥ 0.05). There were nine different remedies prescribed during the course of the study, taking into account the remedy changes that occurred at 3 and 6 months of follow up. The most frequently used and effective medicines were Calcarea carbonicum (n = 8), Lycopodium (n = 6), Phosphorus (n = 5), Hyoscyamus (n = 2), Sulphur (n = 2), Belladonna (n = 1), Argentum nitricum (n = 1), Natrum muriaticum (n = 1) and Pulsatilla (n = 1). Seven patients belonging to the homoeopathy group required a change of prescription during the follow up; two patients who were prescribed Belladonna at baseline required a change to Pulsatilla at third month and Calcarea carbonicum at sixth month, respectively, two other patients who were prescribed Phosphorus at baseline required Calcarea carbonicum at sixth month, two patients who were prescribed Lycopodium at baseline required Phosphorus and Calcarea carbonicum at sixth month, respectively, while one patient who was prescribed Belladonna at baseline required change to Phosphorus after sixth month. These patients required change of medicine at various time points because either they remained status quo of their symptoms or presented with different symptom picture. The same remedy was continued for the entire course of the study in 20 patients in the homoeopathy group. The statistical analysis of medicines, which were prescribed in the study period without any change in prescription with respect to CPRS-R scale, is given in [Table 2]. 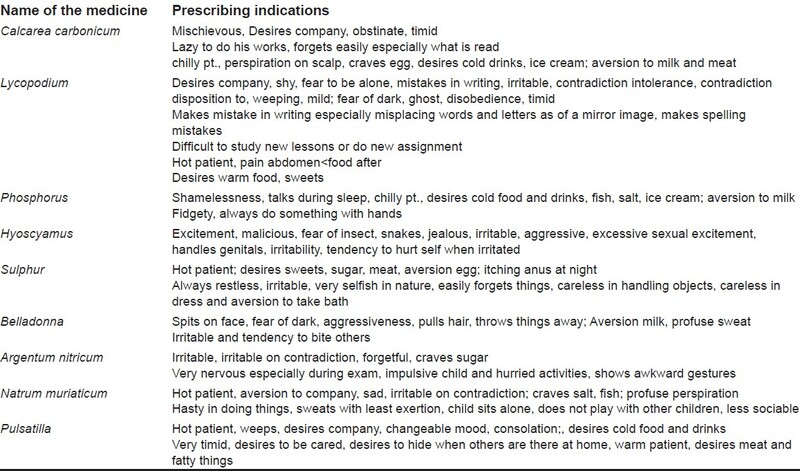 The prescribing indications of the medicines are given in [Table 3]. [Table 4] shows the scores of four domains of CPRS-R and CGI-SS, questionnaires at 3 (T3), 6 (T6), 9 (T9) and 12 months (T12) of treatment in homoeopathy group only [oppositional (P = 0.0001), cognitive problems (P = 0.0001), hyperactivity (P = 0.0001), and ADHD Index (P = 0.0001) of CPRS-R, CGI-SS (P = 0.0001) and CGI-IS (P = 0.0001)]. Independent of treatment group, there was no significant difference at different time points for oppositional (P = 0.21), Cognition problems (P = 0.20), Hyperactivity (P = 0.51), CGI-SS (P = 0.46) except for ADHD-Index (P = 0.04). Post hoc analysis of the results for ADHD-Index with effect size 0.7 as per two-tailed independent t-test [Table 5], sample size of 27 per group, α = 0.05, gives power of 71%, non-centrality parameter of 25%. The acute complaints presented in all the children irrespective of intervention group were treated with individualised homoeopathic medicine apart from the main complaint of ADHD. The data of the same is given in [Table 6]. After wanning of acute complaints within 2-3 days, the children in placebo group continued placebo and the children in medicinal group were reassessed and the medicine was prescribed accordingly i.e., either initial prescription was continued or changed medicine if required was administered as per the discretion of homoeopathic investigator. 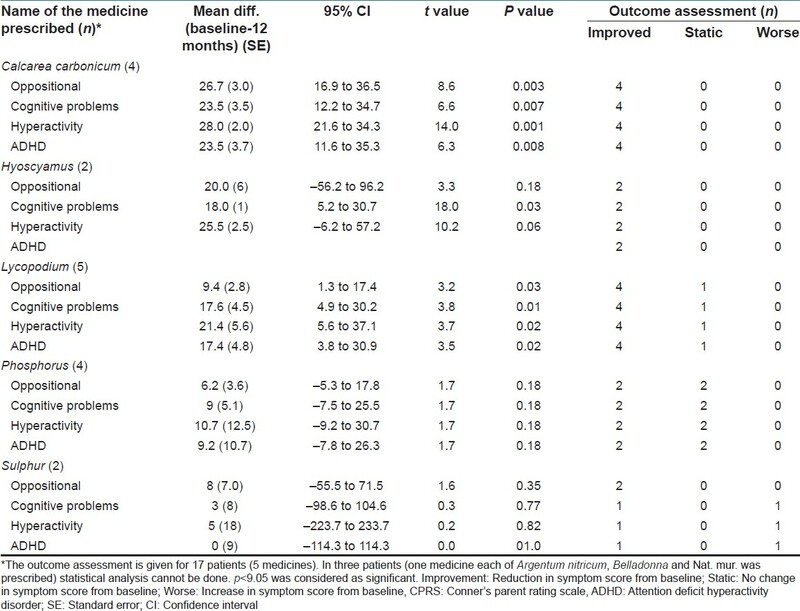 The main results emerged from this study are: (1) there was significant changes in the outcome measures of CPRS-R, CGI-SS and CGI-IS scores compared with baseline in homoeopathy group, (2) the improvement was found to be stable over time of 12 months period and (3) there was significant academic improvement in ADHD children treated with homoeopathy. A significant improvement has been observed in homoeopathy group in all parameters. There was clinically significant decrease from moderately atypical to average typical, which should not raise concern in ADHD-Index. The absolute mean reduction in CGI symptom severity was 1.7 favouring homoeopathy. Patients participating in the study were selected by a rigorous diagnostic evaluation following DSM-IV for ADHD and ruling out any other diagnosis that may imitate ADHD. The main strength of this study is the involvement of consultant psychiatrist in rating the changes. More assessment questionnaires like continuous performance test,  questionnaires related to cognitive behavior  and double-blind methods has not been used, which might have given more strengths to this study. A clinically significant improvement was found in other trials also ,,, wherein homoeopathic LM potencies were used. However, findings of Jacobs et al., do not support these observations. It might be due to an observation period of 18 weeks, which was considered very short by other researchers. Use of single dose at long intervals with external interference such as family conflicts, school-related stress exciting events are some of the other factors for negative results. The duration of treatment is a very important factor for assessment of homoeopathic intervention. Frei et al., in their study concluded that observation time shorter than 12 months may lead to high risk failure, which is found in the Jacobs study,  whereas in this study a follow up for 12 months was considered, and the improvement is clinically significant. Frei and his associates  required median of three different medications in a median time of 5 months to bring a change, however, in our study, median of only one medicine was required throughout the treatment period. In seven patients, change of medicine was required in the homoeopathic group. During 12 months treatment period, there was 1.7 and 2 points decrease in CGI-SS and CGI-IS, which is similar to the findings of Frei et al., that is 1.67 points of Conner's Global index. There was also a 13.7% mean improvement in academic performance, which indirectly reflects improvement in cognitive function [Table 5]. Homoeopathic medicines can be prescribed to all ADHD children irrespective of their parent's economic condition due to its cost effectiveness, easy palatability and least side effects, thus it has major advantage over conventional allopathic medicines, which have potential side effects, , and create concern for parents. At pre-school age, homoeopathy may be the first choice for students and their parents who do not need immediate relief. The treatment was efficacious when medicines were prescribed once daily. Future studies with definite sample size and double-blind design may be carried out to substantiate the results. Pre-school children may be enrolled with stratification of age groups during randomisation. This study design was found feasible and the sample size calculation (two-tailed independent t-test), with effect size 0.7, would require 38 children in each group with power 85%, α = 0.05, for rejecting the null hypothesis in a definite trial. This pilot study provides evidence to support the therapeutic effect of individually selected homoeopathic medicines in children with ADHD. However, the results need to be validated in a larger multi-center prospective randomised double-blind placebo-controlled clinical trial. The authors acknowledge Dr. Suresh Ninan, Consultant Psychiatrist for his support in assessing the patients throughout the trial at CRI (H), Kottayam. Dr. Alok Kumar, former Director General In-charge and Dr. R.K. Manchanda, Director General, CCRH for their constant administrative and technical support; Dr. Rajesh Sagar, Addl. Professor, Department of Psychiatry, AIIMS, for his support in procuring CPRS-R from Multi Health Systems Inc.; Dr. Amit Agarwal, Senior Research Fellow, CCRH headquarters for verification of data; Mrs. Maya Padmanabhan, Statistical Assistant, CCRH headquarters, Mrs. Resmy, Statistical Assistant, CRI (H), Kottayam for providing their statistical inputs in analysis; the patients along with their guardians for their support in this trial. 1. Bloom B, Cohen RA, Freeman G. Summary health statistics for U.S. children: National Health Interview Survey, 2009. National Center for Health Statistics. Vital Health Stat 10. 2010:1-81. 2. Dopheide JA, Pliszka SR. Attention-deficit-hyperactivity disorder: An update. Pharmacotherapy 2009;29:656-79. 3. Diagnostic and Statistical Manual of Mental Disorders. 4 th ed. text rev. Washington: American Psychiatric Association; 2000. 4. Ajinkya S, Kaur D, Gursale A, Jadhav P. Prevalence of parent-rated attention deficit hyperactivity disorder and associated parent-related factors in primary school children of Navi Mumbai-a school based study. Indian J Pediatr 2013;80:207-10. 5. Bhatia MS, Choudhary S, Sidana A. Attention deficit hyperactivity disorder among psychiatric outpatients. Indian Pediatr 1999;36:583-7. 6. Weber W, Newmark S. Complementary and alternative medical therapies for attention-deficit/hyperactivity disorder and autism. Pediatr Clin North Am 2007;54:983-1006. 7. Bussing R, Zima BT, Gary FA, Garvan CW. Use of complementary and alternative medicine for symptoms of attention-deficit hyperactivity disorder. Psychiatr Serv 2002;53:1096-102. 8. Simpson N, Roman K. Complementary medicine use in children: Extent and reasons. A population-based study. Br J Gen Pract 2001;51:914-6. 9. Thompson EA, Mathie RT, Baitson ES, Barron SJ, Berkovitz SR, Brands M, et al. 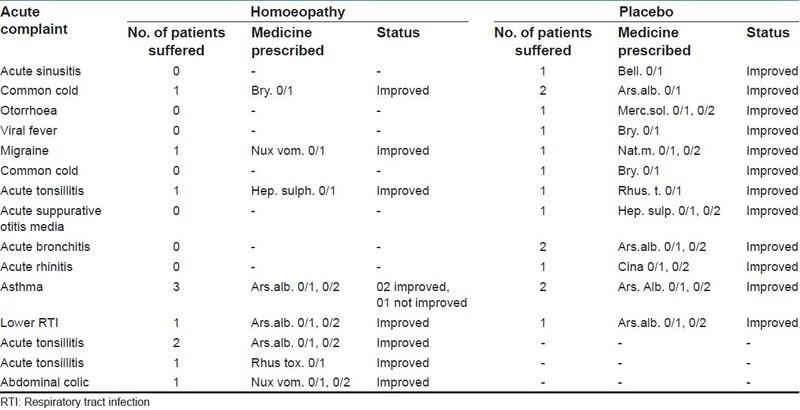 Towards standard setting for patient-reported outcomes in the NHS homeopathic hospitals. Homoeopathy 2008;97:114-21. 10. Lamont J. Homoeopathic treatment of attention deficit hyperactivity disorder. Br Hom J 1997;86:196-200. 11. Frei H, Thurneysen A. Treatment for hyperactive children: Homoeopathy and methylphenidate compared in a family setting. Br Homeopath J 2001;90:183-8. 12. Frei H, Everts R, von Ammon K, Kaufmann F, Walther D, Hsu-Schmitz SF, et al. 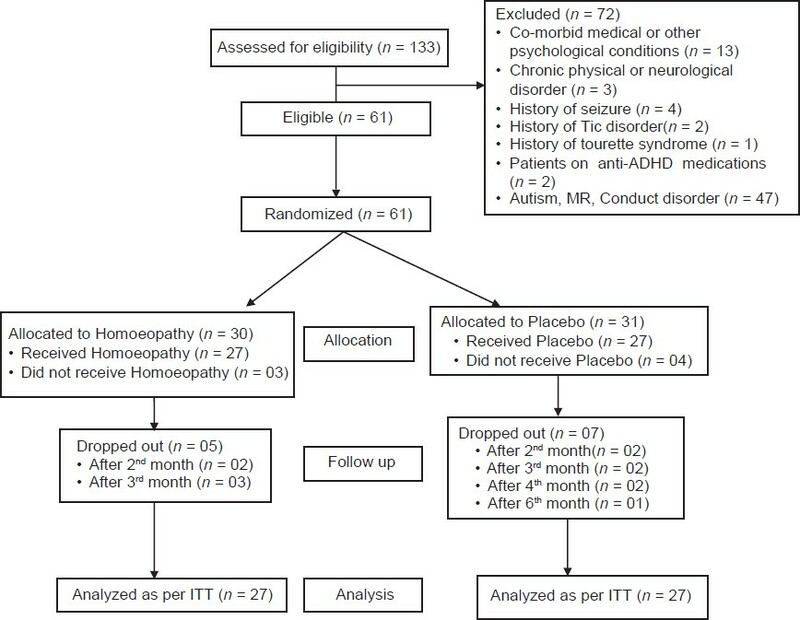 Homeopathic treatment of children with attention deficit hyperactivity disorder: A randomised, double blind, placebo controlled crossover trial. Eur J Pediatr 2005;164:758-67. 13. Frei H, von Ammon K, Thurneysen A. Treatment of hyperactive children: Increased efficiency through modifications of homeopathic diagnostic procedure. Homoeopathy 2006;95:163-70. 14. Frei H, Everts R, Ammon KV, Kaufmann F, Walther D, Schmitz SF, et al. Randomised controlled trials of homoeopathy in hyperactive children: Treatment procedure leads to an unconventional study design. Experience with open-label homeopathic treatment preceding the Swiss ADHD placebo controlled, randomised, double-blind, cross-over trial. Homoeopathy 2007;96:35-41. 15. Jacobs J, Williams AL, Girad C, Njike VY, Katz D. Homoeopathy for attention-deficit/hyperactivity disorder: A pilot randomized-controlled trial. J Altern Complement Med 2005;11:799-806. 16. Frei H, Thurneysen A, von Ammon K. Methodological difficulties in homeopathic treatment of children with ADD/ADHD. J Altern Complement Med 2006;12:104. 17. Coulter MK, Dean ME. Homoeopathy for attention deficit/hyperactivity disorder or hyperkinetic disorder. Cochrane Database Syst Rev 2007:CD005648. 18. Hahnemann Samuel. Organon of Medicine. 6 th ed. Translated by Boericke. New Delhi: WB Jain publishers; 1979:216-60. 19. Kent JT. Repertory of the Homoeopathic Materia Medica. New Delhi: B Jain Publishers (P) Ltd.;1977:253-65. 20. Shah J. Hompath Classic. Version 8.0; Copyright © 2007-2011; Mind Technologies, Mumbai. 21. Conners CK. Conners′ rating scales: Revised technical manual. North Tonawanda: Multi-Health Systems Inc;1997. 22. Guy W. ECDEU assessment manual for psychopharmacology, revised Publication ADM. Bethesda: United States Department of Health, Education, and Welfare; 1976:76-338. Available from: http://ia600503.us.archive.org/10/items/ecdeuassessmentm1933guyw/ecdeuassessmentm1933guyw.pdf [Last accessed on 2008 Nov 18]. 23. Urbaniak GC. Research Randomizer. Available from: http://www.randomizer.org [Last accessed on 2008 Nov 18]. 24. Conners KC. Conners′ rating scales-revised: User′s manual. Tonawanda, New York: Multi-Health Systems, Inc; 1997. p. 42. 25. Kratochvil CJ, Vaughan BS, Stoner JA, Daughton JM, Lubberstedt BD, Murray DW, et al. A double-blind, placebo-controlled study of atomoxetine in young children with ADHD. Pediatrics 2011;127:862-8.